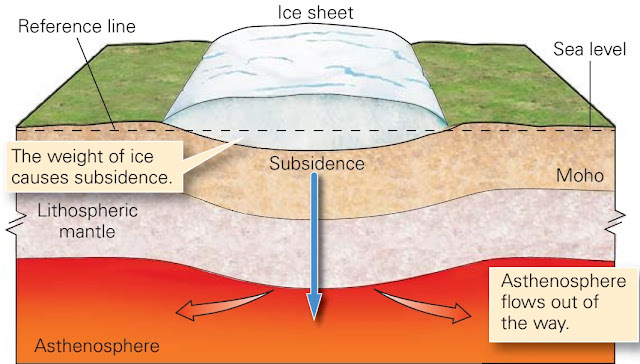 When a large ice sheet (more than 50 km in diameter) grows on a continent, its weight causes the surface of the lithosphere to sink. In other words, ice loading causes glacial subsidence. Lithosphere, the relatively rigid outer shell of the Earth, can sink because the underlying asthenosphere is soft enough to ﬂow slowly out of the way (figure above). Because of ice loading, much of Antarctica and Greenland now lie below sea level, so if their ice were instantly to melt away, these continents would be ﬂooded by a shallow sea. What happens when continental ice sheets do melt away? 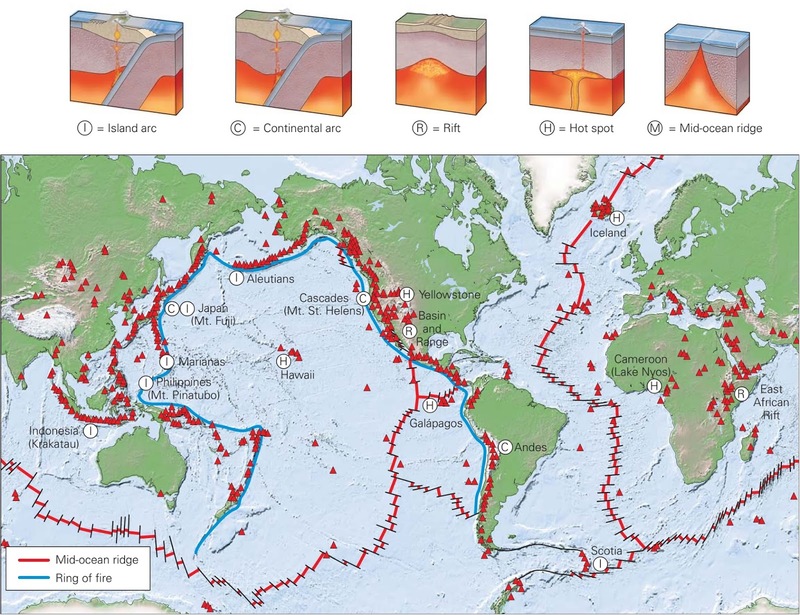 Gradually, the surface of the underlying continent rises back up, by a process called glacial rebound, and the asthenosphere ﬂows back underneath to ﬁll the space. This process doesn't take place instantly, the asthenosphere ﬂows so slowly (at rates of a few millimetres per year) that it takes thousands of years for ice-depressed continents to rebound. 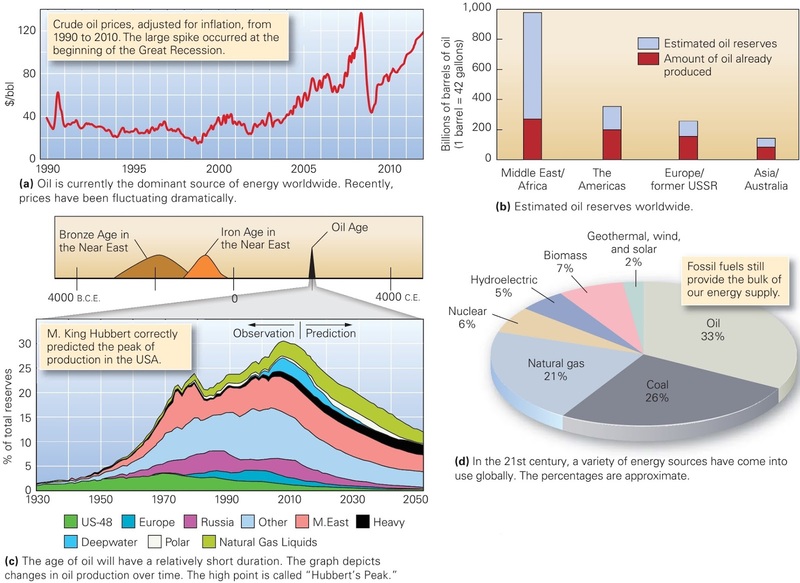 Thus, glacial rebound is still taking place in some regions that were covered by ice during the Pleistocene Ice Age. The glacial conveyor and the formation of lateral and medial moraines on glaciers. Glaciers can carry sediment of any size and, like a conveyor belt, transport it in the direction of ﬂow (that is, toward the toe; figure above a). The sediment load either falls onto the surface of the glacier from bordering cliffs or gets plucked and lifted from the substrate and incorporated into the moving ice. 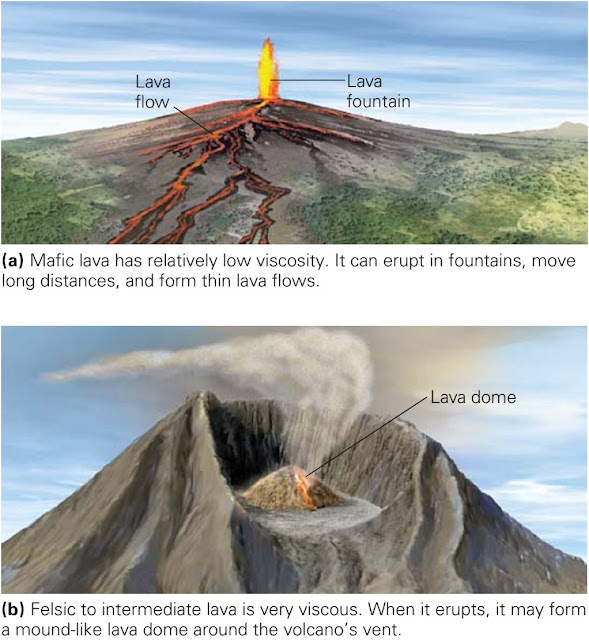 Geologists refer to a pile of debris carried by or left by glaciers as a moraine. Sediment dropped on the glacier’s surface moves with the ice and becomes a stripe of debris. Stripes formed along the side edges of the glacier are lateral moraines. When a glacier melts, lateral moraines lie stranded along the side of the glacially carved valley, like bathtub rings. Where two valley glaciers merge, the debris constituting two lateral moraines merges to become a medial moraine, running as a stripe down the interior of the composite glacier (figure above b). Trunk glaciers created by the merging of many tributary glaciers contain several medial moraines. Sediment transported to a glacier’s toe by the glacial conveyor accumulates in a pile at the toe and builds up to form an end moraine. 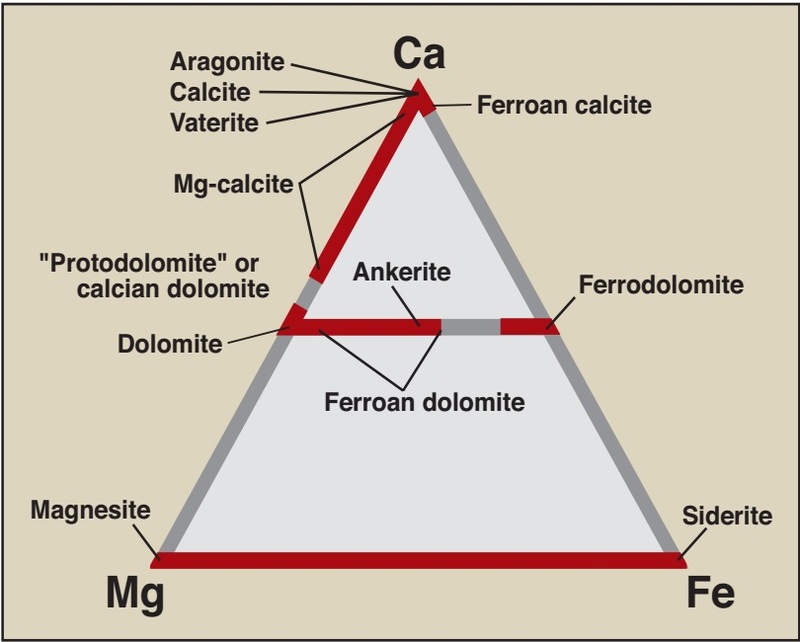 Products of glacial erosion. Ice is a very aggressive agent of erosion. 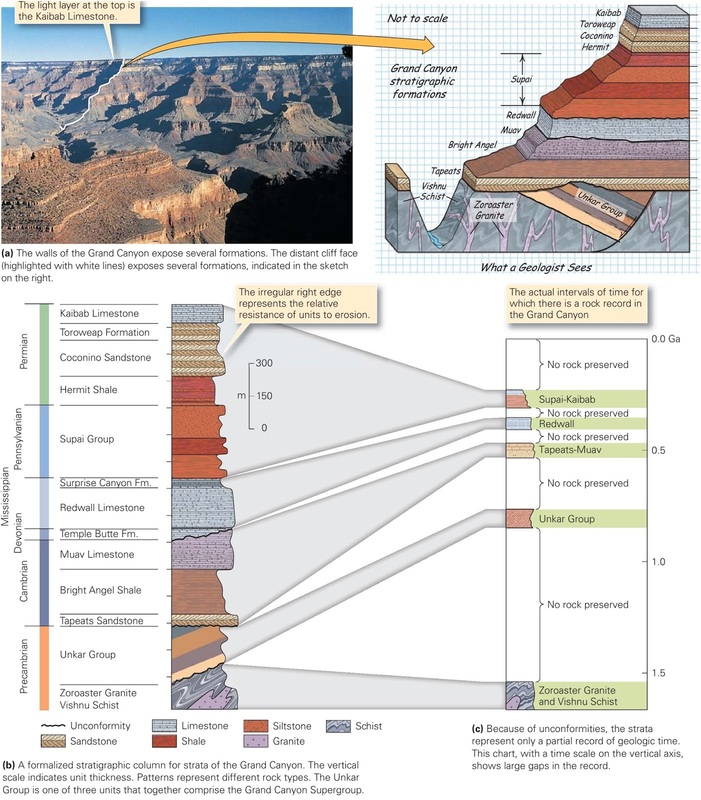 During the last ice age, valley glaciers cut deep, steep-sided valleys into the Sierra Nevada mountains of California. In the process, some granite domes were cut in half, leaving a rounded surface on one side and a steep cliff on the other. Half Dome, in Yosemite National Park, formed in this way (figure above a); its steep cliff has challenged many rock climbers. Such glacial erosion also produces the knife-edge ridges and pointed spires of high mountains (figure above b) and broad expanses where rock outcrops have been stripped of overlying sediment and polished smooth (figure above c). 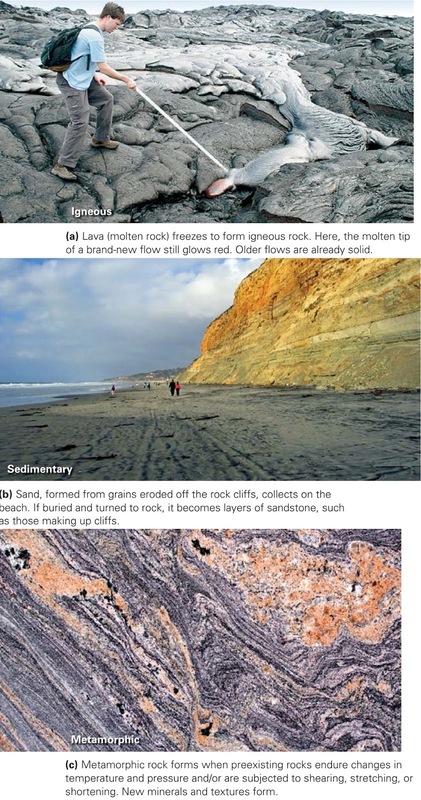 In many localities, the rock surface visible today is the same rock surface once in contact with ice. In some places, subsequent rockfalls and river erosion have substantially modiﬁed the surface. As glaciers ﬂow, clasts embedded in the ice act like the teeth of a giant rasp and grind away the substrate. 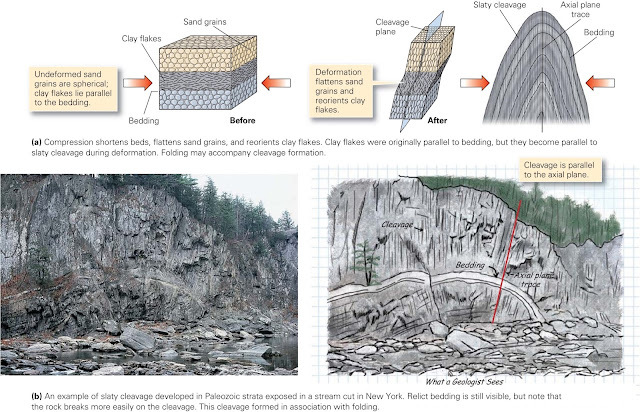 This process, glacial abrasion, produces long gouges, grooves, or scratches called glacial striations (figure above d). 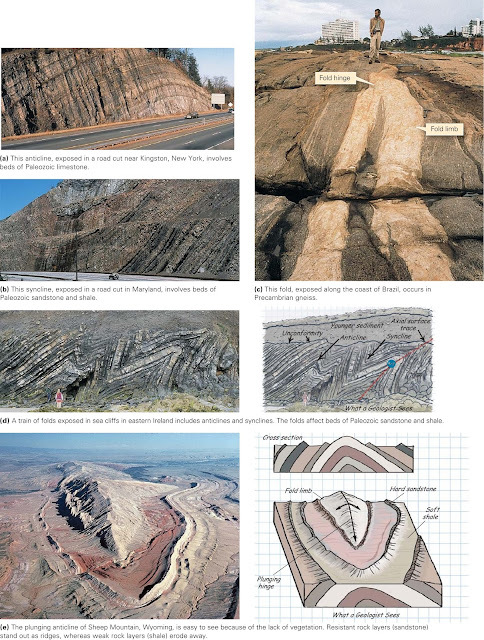 Striations range from 1 cm to 1 m across and may be tens of centimeters to tens of meters long. As you might expect, striations run parallel to the ﬂow direction of the ice. Rasping by embedded sand yields shiny glacially polished surfaces. Glaciers pick up fragments of their substrate in several ways. 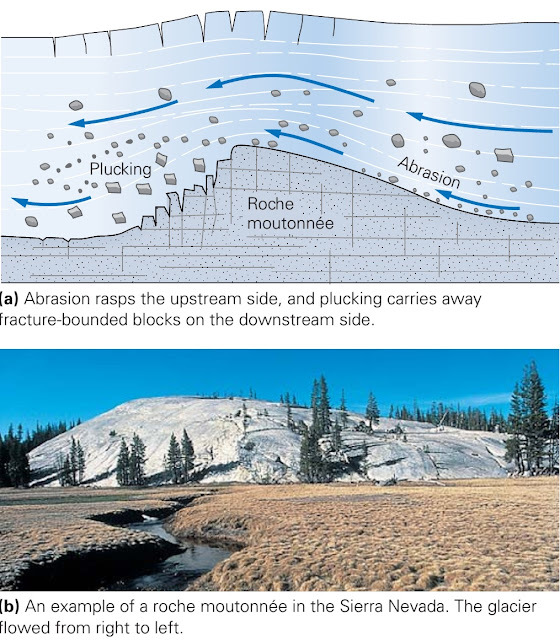 During glacial incorporation, ice surrounds debris so the debris starts to move with the ice. During glacial plucking (or glacial quarrying), a glacier breaks off fragments of bedrock. 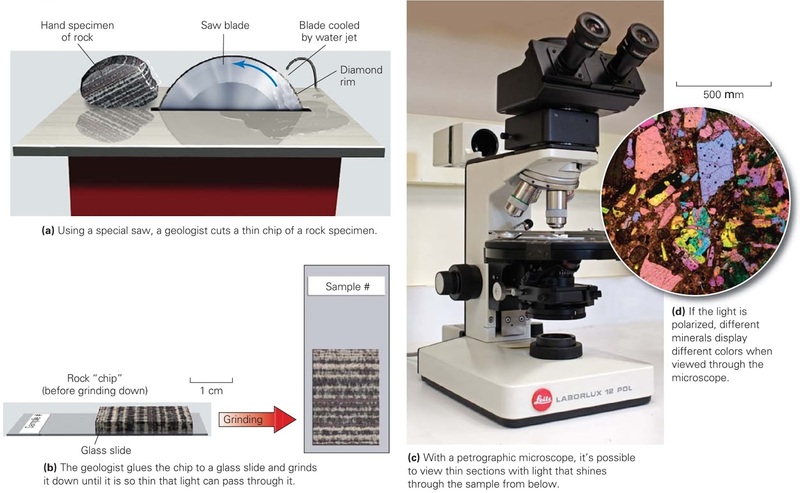 Plucking occurs when ice freezes around rock that has just started to separate from its substrate, so that movement of the ice can lift off pieces of the rock. At the toe of a glacier, ice may actually bulldoze sediment and trees slightly before ﬂowing over them. 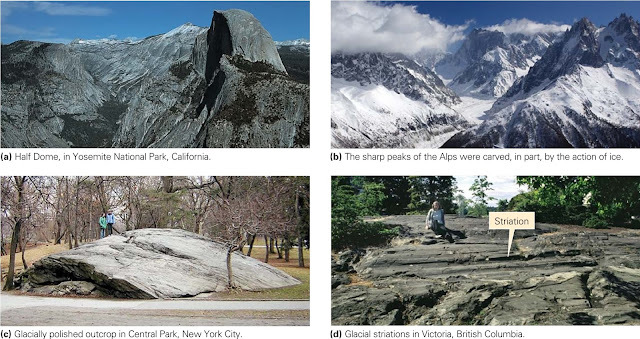 Landscape features formed by the glacial erosion of a mountains landscape. Let’s now look more closely at the erosional features associated with a mountain glacier (figure above a). Freezing and thawing during the fall and spring help fracture the rock bordering the head of the glacier (the ice edge high in the mountains). This rock falls on the ice or gets picked up at the base of the ice, and moves downslope with the glacier. As a consequence, a bowl-shaped depression, or cirque, develops on the side of the mountain. If the ice later melts, a lake called a tarn may form at the base of the cirque. 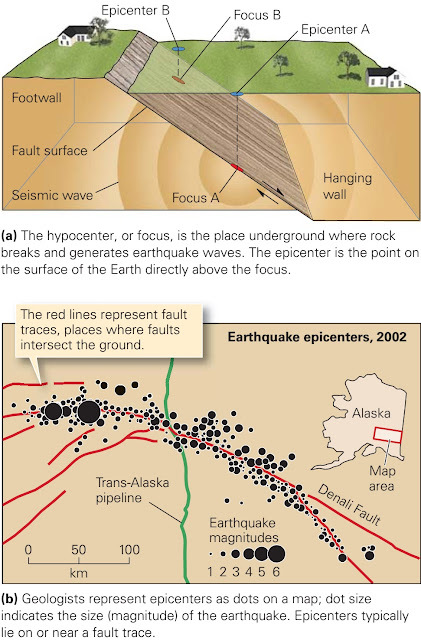 The shape of a cirque may be maintained or even ampliﬁed by rockfalls after the glacier is gone. An arête (French for ridge), a residual knife-edge ridge of rock, separates two adjacent cirques. A pointed mountain peak surrounded by at least three cirques is called a horn. The Matterhorn, a peak in Switzerland, is a particularly beautiful example of a horn; each of its four faces is a cirque (figure above b). 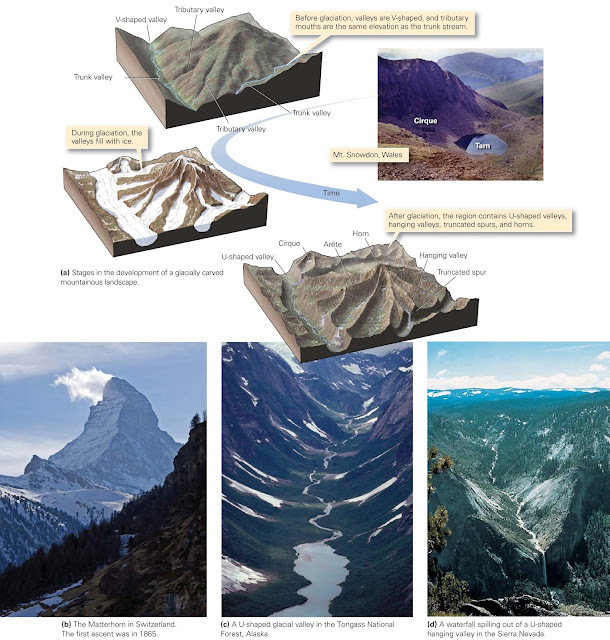 Glacial erosion severely modiﬁes the shape of a valley. To see how, compare a river-eroded valley with a glacially eroded valley. 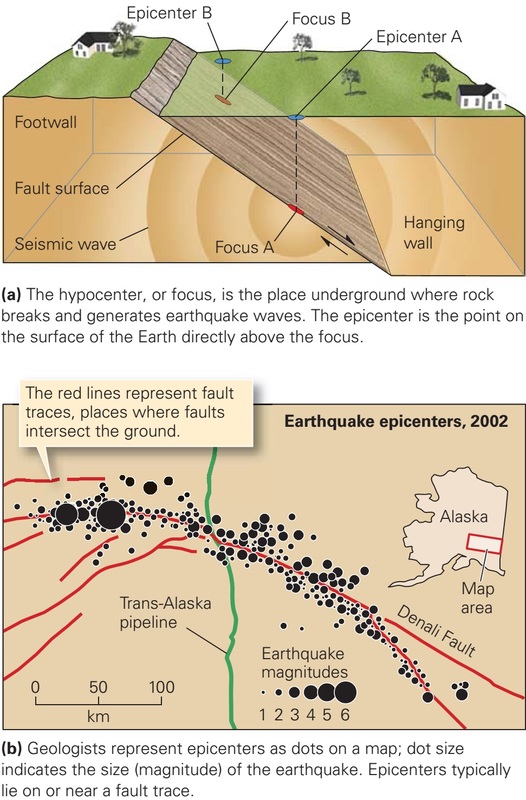 If you look along the length of a river in unglaciated mountains, you’ll see that it typically ﬂows down a V-shaped valley, with the river channel forming the point of the V. The V develops because river erosion occurs only in the channel, and mass wasting causes the valley slopes to approach the angle of repose. But if you look down the length of a glacially eroded valley, you’ll see that it resembles a U, with steep walls. 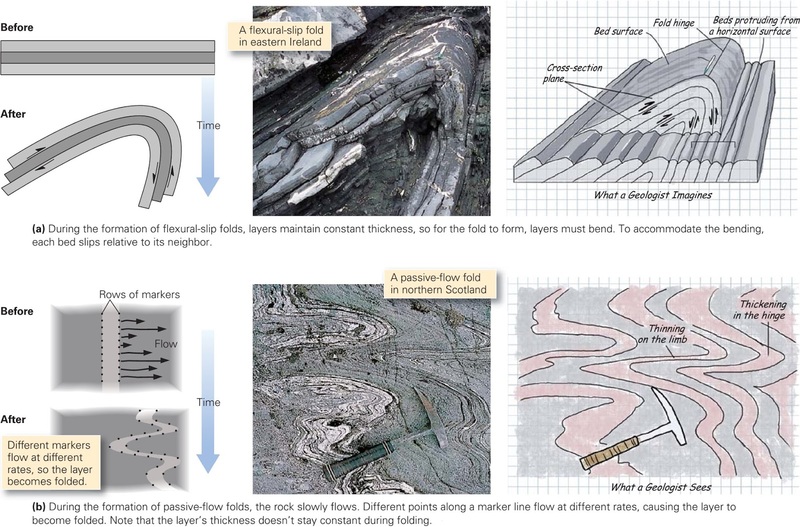 A U-shaped valley (figure above c) forms because the combined processes of glacial abrasion and plucking not only lower the ﬂoor of the valley but also bevel its sides. Glacial erosion in mountains also modiﬁes the intersections between tributaries and the trunk valley. In a river system, the trunk stream serves as the local base level for tributaries, so the mouths of the tributary valleys lie at the same elevation as the trunk valley. The ridges (spurs) between valleys taper to a point when they join the trunk valley ﬂoor. During glaciation, tributary glaciers ﬂow down side valleys into a trunk glacier. But the trunk glacier cuts the ﬂoor of its valley down to a depth that far exceeds the depth cut by the tributary glaciers. Thus, when the glaciers melt away, the mouths of the tributary valleys perch at a higher elevation than the ﬂoor of the trunk valley. 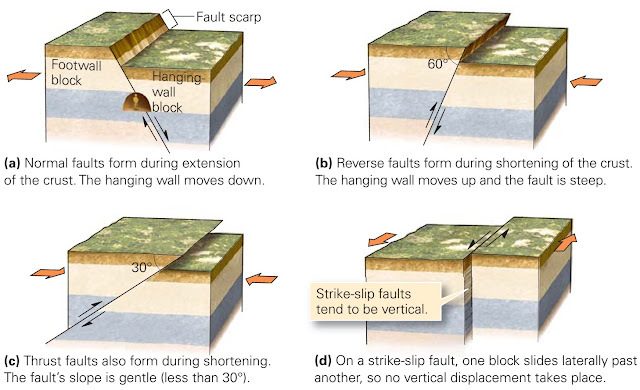 Such side valleys are called hanging valleys. The water in a post-glacial stream that ﬂows down a hanging valley cascades over a spectacular waterfall to reach the post-glacial trunk stream (figure above d). As they erode, trunk glaciers also chop off the ends of spurs (ridges) between valleys, to produce truncated spurs. A roche moutonnée is an asymmetric bedrock hill shaped by the flow of glacial ice. 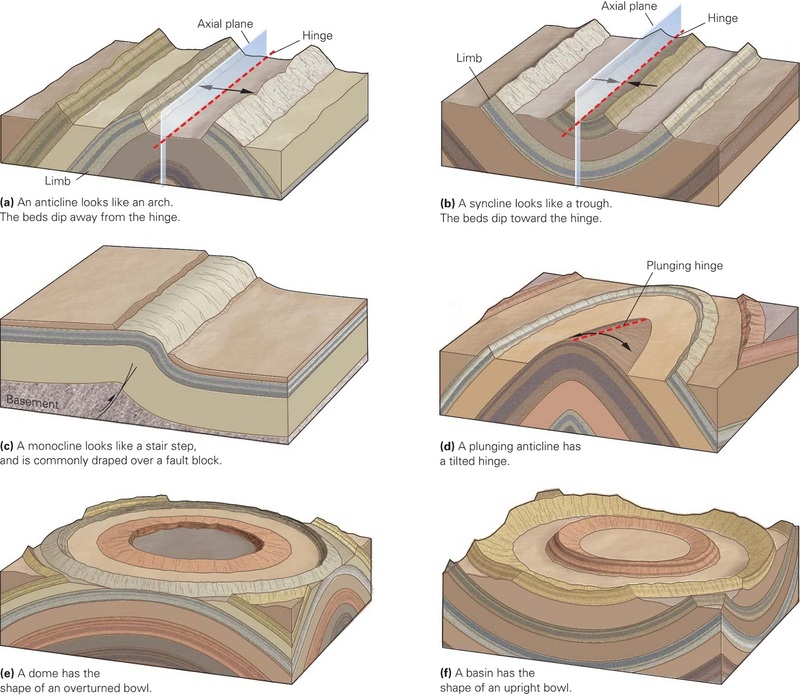 Now let’s look at the erosional features produced by continental ice sheets. To a large extent, these depend on the nature of the pre-glacial landscape. 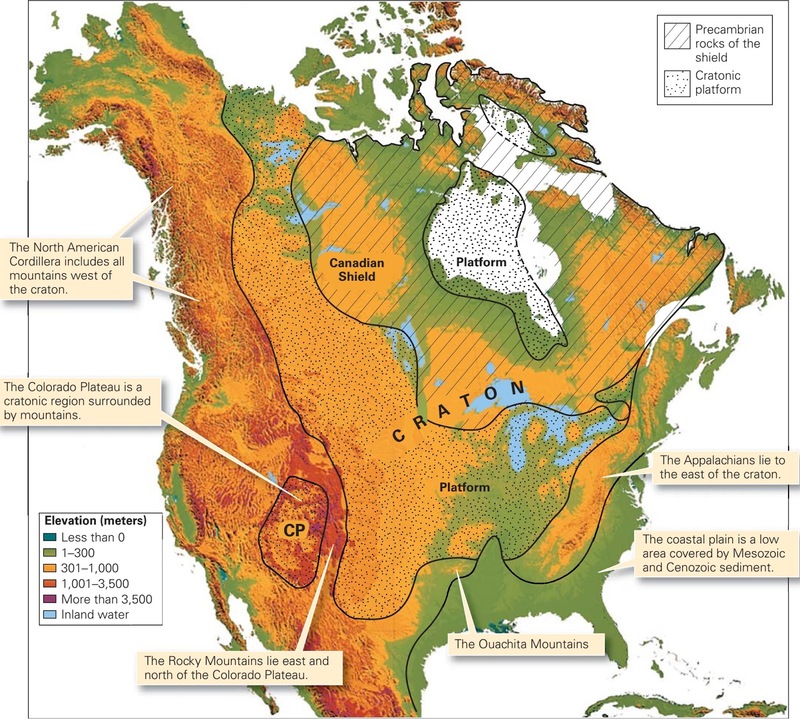 Where an ice sheet spreads over a region of low relief, such as the Canadian Shield, glacial erosion creates a vast region of polished, ﬂat, striated surfaces. Where an ice sheet spreads over a hilly area, it deepens valleys and smooths hills. Glacially eroded hills may end up being elongate in the direction of ﬂow and may be asymmetric, for glacial rasping smoothes and bevels the upstream part of the hill, creating a gentle slope, whereas glacial plucking eats away at the downstream part, making a steep slope. 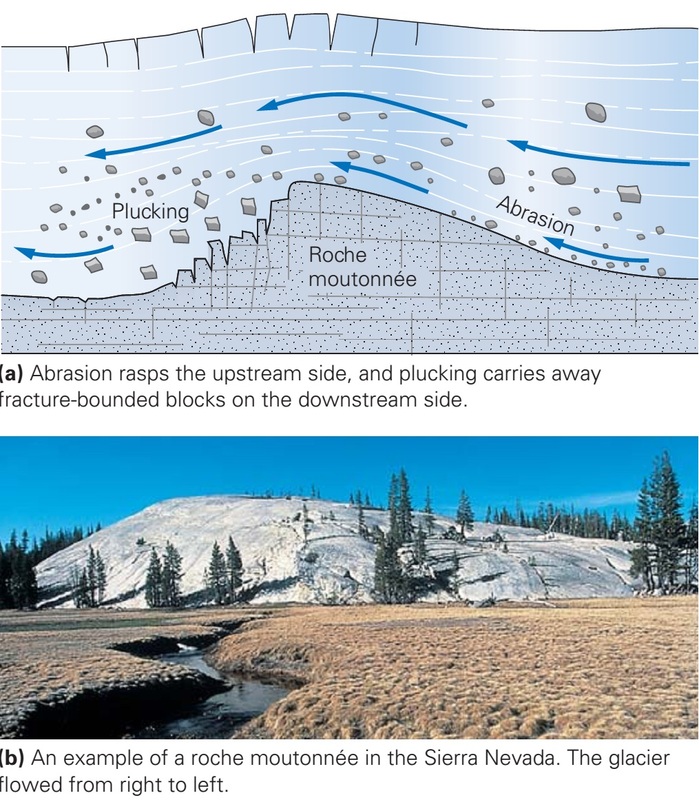 Ultimately, the hill’s proﬁle may resemble that of a sheep lying in a meadow such a hill is called a roche moutonnée, from the French for sheep rock (figure above a, b). One of the many spectacular fjords of Norway. The water is an arm of the sea that fills a glacially carved valley. 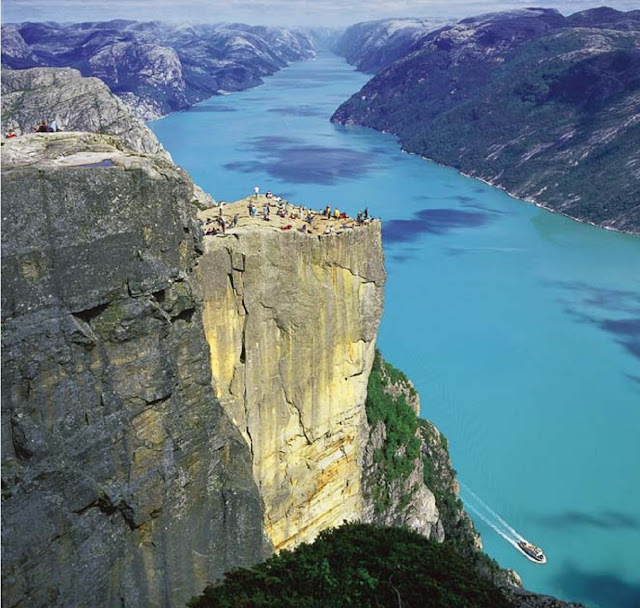 Tourists are standing on Pulpit Rock (Prekestolen). As noted earlier, where a valley glacier meets the sea, the glacier’s base remains in contact with the ground until the water depth exceeds about four-ﬁfths of the glacier’s thickness, at which point the glacier ﬂoats. 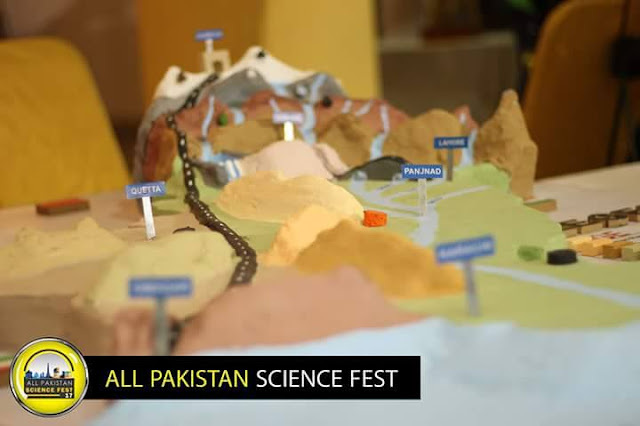 Thus, glaciers can carve U-shaped valleys even below sea level. In addition, during an ice age, water extracted from the sea becomes locked in the ice sheets on land, so sea level drops signiﬁcantly. Therefore, the ﬂoors of valleys cut by coastal glaciers during the Pleistocene Ice Age were cut much deeper than present sea level. Today, the sea has ﬂooded these deep valleys, producing fjords. In the spectacular fjord-land regions along the coasts of Norway, New Zealand, Chile, and Alaska, the walls of submerged U-shaped valleys rise straight from the sea as vertical cliffs up to 1,000 m high (figure above). Fjords also develop where an inland glacial valley ﬁlls to become a lake. The nature of ice and the formation of glaciers. Snow falls like sediment and metamorphoses to ice when buried. Ice consists of solid water, formed when liquid water cools below its freezing point. 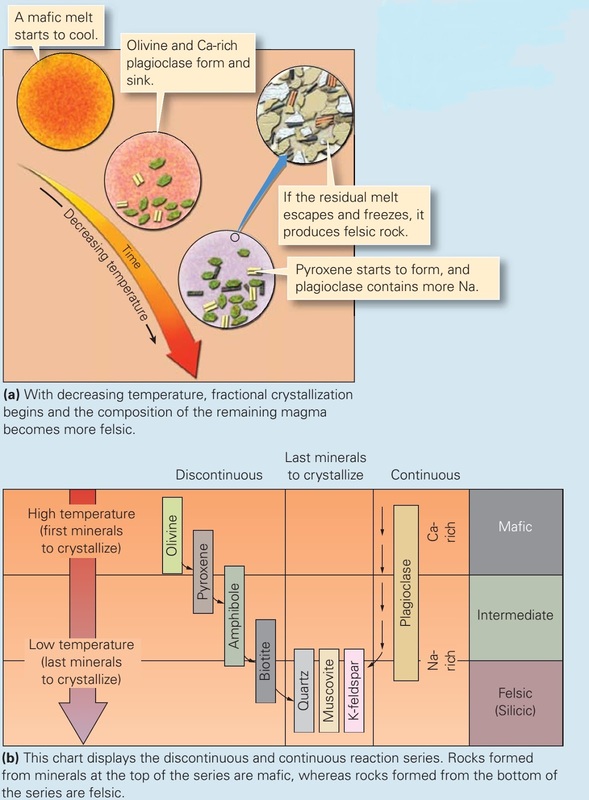 We can apply concepts introduced in our earlier discussions of rocks and minerals to distinguish among various occurrences of ice. For example, we can think of a single ice crystal as a mineral specimen, for it is a naturally occurring, inorganic solid, with a deﬁnite chemical composition (H2O) and a regular crystal structure. 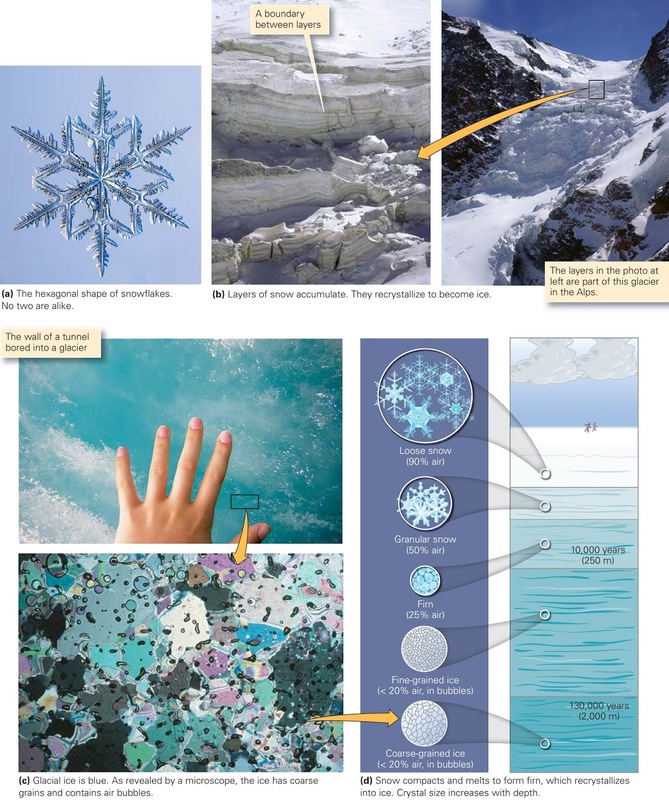 Ice crystals have a hexagonal form, so snowﬂakes grow into six-pointed stars (figure above a). 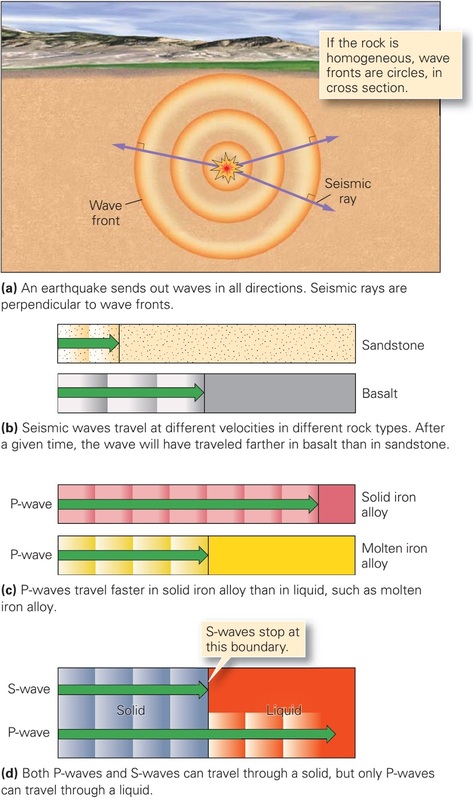 We can picture a layer of fresh snow as a layer of sediment, and a layer of snow that has been compacted so that the grains stick together as a layer of sedimentary rock (figure above b). We can also think of the ice that appears on the surface of a pond as an igneous rock, for it forms when molten ice (liquid water) solidiﬁes. Glacial ice, in effect, is a metamorphic rock. 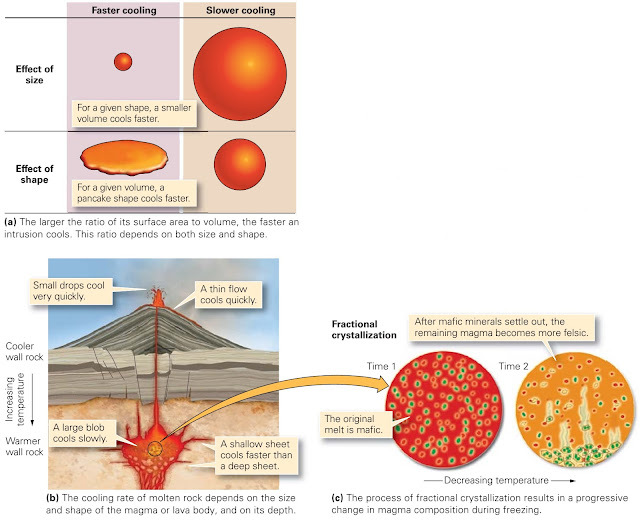 It develops when pre-existing ice recrystallizes in the solid state, meaning that the molecules in solid water rearrange to form new crystals (figure above c).